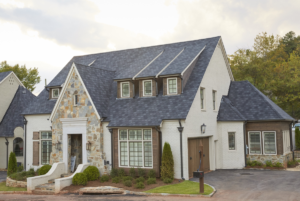 The 2015 Birmingham Home and Garden Inspiration Home located at Calton Hill, a new home community in Mountain Brook, showcases the latest trends in home design. Created to live large on a smaller footprint, the Inspiration Home offers more than enough space for family life and entertaining without all the maintenance and upkeep—and without any wasted rooms. Owners will truly use and enjoy every area of this home. The overall design demonstrates that the current trend of downsizing doesn’t have to mean sacrificing style or space. Visitors will enjoy seeing just how a spacious home on a smaller lot can live effectively. The two-story home features a grand living area that rises to a second-floor balcony. The home offers one-level living perfect for empty-nesters but also includes a spacious second floor that suits the needs of a growing family. An open plan welcomes a sunny kitchen and dining area for convivial gatherings. Other main-floor spaces include a living room, a home office, and a master suite that boasts a fireplace and generous ensuite bath. A covered porch and adjacent dipping pool offer private, outdoor living. Upstairs, three bedrooms and two baths perfectly fit kids or visiting grandchildren. An elevator bank (currently a wine closet) helps make this house a forever home. Other amenities include a gated entry, smart home features, gas lanterns, and Energy Star ratings. 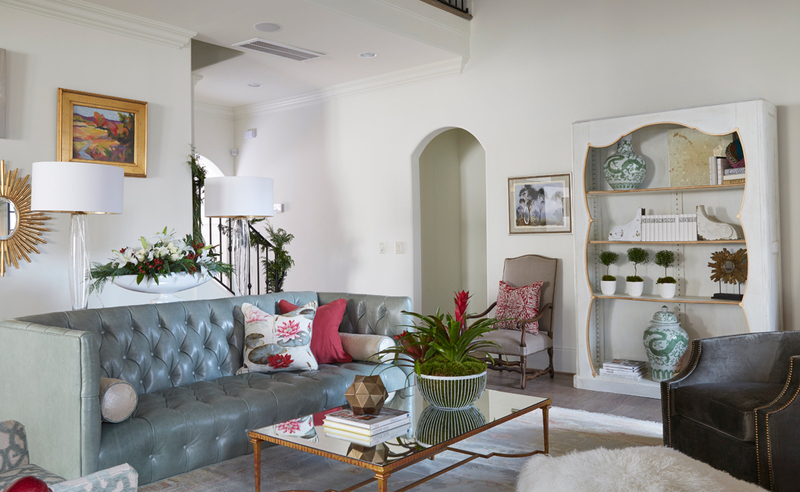 The living area brings together traditional and contemporary design elements with fresh colors and new furnishings for a lively, transitional feel. A leather sofa in soft blue-green displays classic lines of a Chesterfield sofa. A pair of patterned Chenille armchairs pull up to a gilded-and-glass coffee table. An extra pair of side chairs flank the bookcase for additional seating. Poppy red punctuates the space with a bit of color in pillows and accessories. “People are moving away from the neutrals and becoming less afraid of color, ” says residential designer Adam Gerndt. “This room shows how color can ground a space, much like a neutral, yet still have vibrancy.” An Oushak rug underfoot unites all of the hues in a pretty, soft pattern. Designed Janet Clifton and Marie Noojin of Defining Home and Adams Gerndt Design Group grouped the sofa and chairs with regard to room flow and seating areas. Floating furniture in the middle of the room, away from walls, created a hall of sorts behind the sofa so owners can have clear passage without interupting conversation. The empty wall spaces offered a spot for a bookcase filled with decorative objects on one wall, while the stair wall behind the sofa became a salon-style wall for displaying a variety of works by local and regional artists including Carolyn Goldsmith, Bonnie Fuchs, Katie Robinson, and Linda Donahue. Mixing and matching artwork in a variety of mediums and frame styles gives a collected-over-time-look to the arrangement. Klismos-style dining chairs finished in a lighter saddle brown stain add warmth to the room and create additional visual contrast against the darker table. A rich charcoal velvet covers the seats. A hand-woven rug made from natural dye-free wool anchors the room while the intricate speckled pattern comes from the nature of the pure, fine wool and provides texture without pattern. Above, a chandelier is suspended from a cofferd ceiling. “We selected the chandelier for its light, open feel and unique design, ” says Chris. A standout against the white walls and antiqued mirrors, the fixture’s black metal finish, accented with gold, adds just enough glamour without going overboard. “Its bobeches and circular disk accents made from recycled glass create additional visual interest, ” Chris adds. Lightweight linen drapes accented with a subtle yet elegant diamond pattern soften the windows and filter light when needed. On the walls, a framed grouping of nine custom-framed vintage architectural prints are arranged to create visual symmetry above the sideboard. Opposite, a large abstract landscape painting in warm neutral tones embellished with soft gold accents and a high gloss epoxy finish lends an elegant contemporary feel to the space. Just off the main living area, Jim Kelly designed a small nook—perfect for a little breakfast area or sitting room. The designers at Issis & Sons Furniture and Flooring Galleries took advantage of the sunny space and filled it with a pair of comfortable upholstered chairs just right for coffee and reading. A tall étagere is filled with plants that take advantage of the natural light. Above, a vaulted ceiling finished in stained wood adds architectural interest. The hanging lantern provides a soft glow during evening hours. The freestanding range boasts six gas burners that ensure even heat at precise temperatures. Innovative features include soft-close oven doors; full, easy-glide extension racks; LED lighting to accent the control panel and knobs; and more. The dishwasher, one of the quietest on the market, offers a built-in water softener to prevent glassware and dishes from hard water etching. A central island serves impromptu meals or breakfast. Countertops are Zodiac Quartz Stratus White—a pretty, light complement to the room’s warm grays and polished finishes. Extending the quality to an outdoor kitchen, Southern Kitchen & Bath installed the 42-inch Coyote gas Grill with two-drawer cabinets and 12-inch stainless side burner. An outdoor refrigerator keeps cold beverages close at hand while lounging under the private, covered verandah. The room is designed for a woman that needs a peaceful surrounding for all her ideas to run wild but also desires a professional look that is appropriate for meetings. Panels along one wall serve as an anchor to the room and provide interest and warmth in the space. Made from Mary McDonald Schumacher fabric, the panels can also be used as a pin board for invites, notes, and cards. Variations of the neutral colors in the panels are repeated throughout the space. The designers introduced color through pops of green and blue in the artwork and pottery. “We love the photo of Venice by the talented Hardie Cobbs, and we made the room a little more personal by adding in one of my own works on paper, ” says Katherine. On the floor, the designers created dimension by layering a hide on top of a sisal. They continued the layering with lighting. “Think different heights, different locations, and different intensities that can change throughout the day, ” explains Katherine. In order to introduce a contemporary edge to the room, they chose standout fixtures. “For example, the desk lamp by Aerin is both functional and cool—a little piece of sculpture on your desk, ” says Katherine. Lighting was also added in unexpected places such as over the bookshelves. The modern fixtures wash the shelves with a pleasing amount of light that helps complete the look of the space. “Our hope is that the room will be both peaceful and inspiring to all that take a seat at the desk, ” says Katherine. The study serves as a multi-use space that can be utilized by anyone in the home. A wooden sawhorse desk provides a spot for grownups to pay bills and manage other family matters or for children to study and complete homework assignments. By facing the desk toward the window, the designers gave it a bit of separation from the rest of the room in order to eliminate distractions. In one corner, a comfortable chair pairs with a modern lamp to create the perfect reading nook. A window alcove offers space for storing craft materials, wrapping supplies, or other necessities. A soft carpet underfoot adds a layer of warmth and comfort. 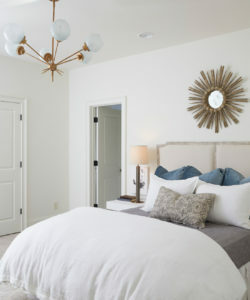 A neutral palette in the master bedroom creates a soothing, calm oasis. “We made the four poster bed as the focal point of the space, ” says Caitlin Ogren, manager of Three Sheets in Homewood. “Its feminine lines add a certain elegance to the room.” Punches of gold, as seen in the sunburst mirror over the bed and in the mirrored nightstands, add a bit of glamour, while silver vase-style lamps continue the reflective theme. A freestanding wall mirror is in line with the fireplace, bringing even more reflection into the room. Contrasting the sleek design, washed wood walls lend a rustic feel to the space. A limestone mantel surround introduces a refined design. More texture comes in the nailhead trimmed chest of drawers opposite the bed. Simple window treatments keep the room’s casual edge in check and allow an abundance of natural light to wash over the space. Matching gray velvet chairs flank the fireplace, providing a cozy spot to rest and refresh after a long day. Plush bedding, satin pillows, and a faux-fur lined stool up the luxury quotient. And to give the room a one-of-a-kind look, Caitlin and her team hand-picked a Turkish rug that brings a hint of color into the space. The master bathroom is a reflection of a spa-like getaway, complete with all the essentials. The mostly white color palette adds to the sense of relaxation and serenity. The oversize bathtub tucks into a nook for privacy. The arched opening framing the tub and marble-look tile create a grand framework. In the shared space, a dark wood dual vanity offers a pleasing contrast to the neutral surroundings and brings the sophisticated look of custom-built furniture to the space. 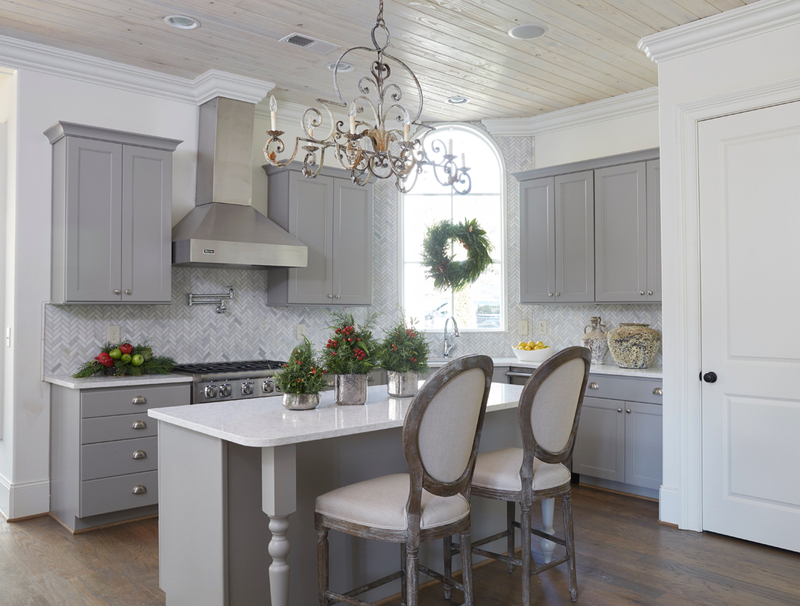 Mirrors, lighting, and fixtures are shiny silver, adding a touch of glamour. Mercury glass accents add glitz. A pair of small Turkish rugs and a painted landscape display a bit of muted color that interacts nicely with the more simplistic décor. 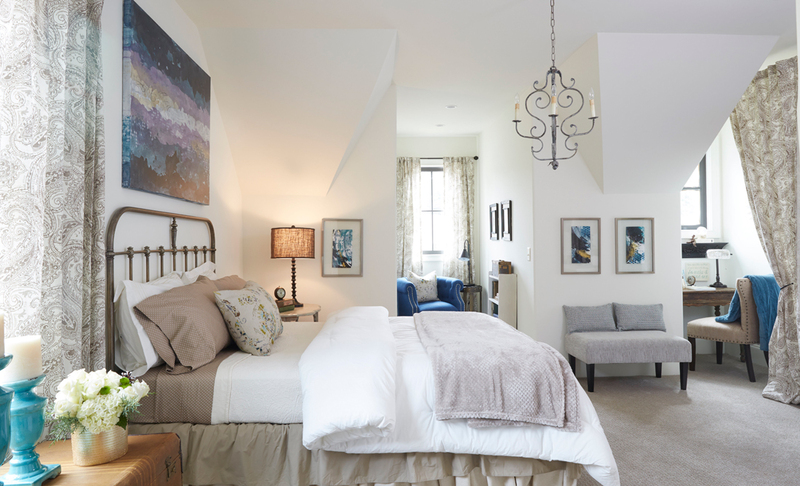 This large, upstairs guest room boasts two dormer windows. “Dormers are cute and charming, but people tend to have problems knowing what to do with them on the inside, ” says designer Karen Sovacool. Used to tackling difficult spaces, this home stager created a writer’s retreat in one nook with a writing desk and a curtain that can be drawn for privacy. The other nook became a cozy spot for reading. Karen explains that the best thing about this room is the amount of light. “I kept the curtains very airy but I did want some pattern in the room, ” she says. “The furnishings are a combination of new pieces and a few antiques and the artwork is by Karly Martin, a local artist who does amazing contemporary work. I am in love with this cerulean blue I am seeing everywhere in design, and her pieces have great color.” Karen says she loves the combination of antiques and rustic pieces with modern abstract art, which you can see here and throughout the house. A subtle exercise in contrast, this upstairs guest room showcases a timeless mix of old and new, with classically inspired pieces mingling with accessories of a more modern influence. “Materials range from distressed wood and sleek metal, linen and leather, and warm antique brass and gold leaf—combining to create an elegant yet restrained and unfussy space, ” says lead designer Chris Magidson. Locally-crafted, hand-finished custom bedside tables with steel bases and hardwood tops are accessorized with leather-wrapped lamps to create a masculine counter to the more feminine upholstered headboard, ribbon-front chest, and slipper chair. A variety of artwork includes hazy abstracts, architectural prints, and black-and-white photography, helping to maintain the eclectic feel. Thank you to our Inspiration Home Sponsors!